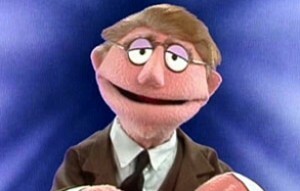 Leo pitches “The Muppet Show”! And now, after viewing the two failed ABC pilots, we come to Jim Henson’s next attempt to finally bring The Muppet Show to primetime, one which ultimately proved successful but not directly or immediately. In 1965, IBM hired Jim Henson to make a number of short “industrial” films for their company, which were effectively intended as comedic shorts to break the tedium of long meetings. Later on, Jim would produce similar short pieces called the Muppet Meeting Films which could be used for any corporate client, and some of which were actually remakes of these early bits for IBM. I wasn’t able to get exact dates for all of these films, and some of them I know are from 1965, so I’ll be jumping backwards in the chronology a bit here, but it seemed like it would make most sense in this case to combine them all in one place. In 1967, Jim Henson made a one-minute short film for “Expo67,” which was a World’s Fair, in Montreal, Quebec. Called Ripples, it is reminiscent of Time Piece in its use of a stream-of-consciousness series of images that flow emotionally rather than logically, however in a much more compressed format, as well as the Bufferin ad in the previous post in its exploration of the human mind. 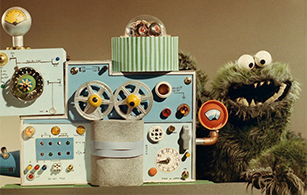 Over the course of the minute, an architect played by Jon Stone–a producer who collaborated with Jim on a Cinderella pilot in 1965, and would later bring Jim on board to Sesame Street, and even later write The Monster at the End of This Book–drops a lump of sugar into his coffee, causing ripples in the glass, which fades to a shot of him by a lake, tossing pebbles into the water, each ripple bringing up images in his mind of architecture and art, moments of great progress throughout history and the then-modern day/future (illustrated via shots of NASA rockets and mission control centers), his home life, and his family. In a few short moments, it establishes ripples of connection between humanity, human progress and achievement, nature, and us.